Not one, not two but EIGHT books in today's giveaway. 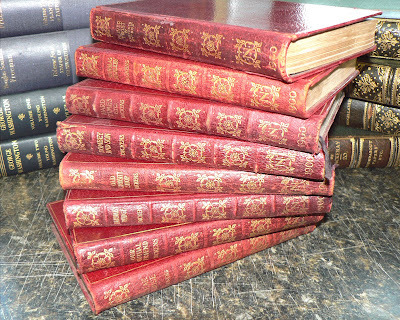 Not just any books, but eight volumes from Charles Dickens' works in lovely red leather with gilt edging and design. 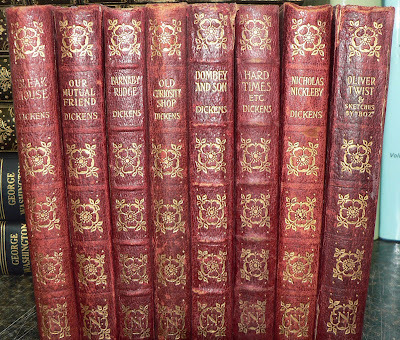 Everyone loves Dickens, right? 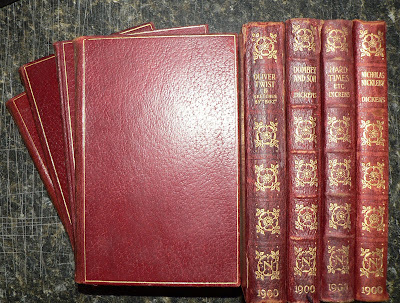 All volumes are stamped 1900 and are published by Thomas Nelson and Sons. No funky rules to enter, just comment in this thread, message me on Twitter, leave a note on our reddit or Facebook pages, our use the old fashioned 'Contact Me' form. Good luck - I will announce the winner tomorrow afternoon. I just want your job! Or to work with you. I love old books. 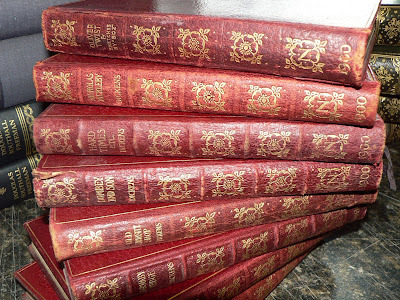 Any time I need research or reference books, I try to get them printed before 1940 if I can. Gives me a chance to imagine all the other hands that touched it before me. And yes, you were right yesterday. This is a sweet giveaway! Enter me please. Very cool! Yes, please! I love antique books! They have so much character to them. Hands itchy with covetousness!You were right this giveaway totally makes up for lack of post. I know you'll likely pick randomlly, crossing fingers anyway. I'm never random, except when I'm randomly so. Just recently started reading your blog, but it's wonderful! Thought I'd enter, what's to lose? Right here please pick me!!!!! Ooooh I'd love to win! Could there be a better price? pick me! me mumsy would love these (and right in time for mother's day, eh?). Sure, I'll enter. This is the total entry form? Thanks for the opportunity. Do we know who won? I can't believe I missed this. Argh!